Not Sure which Tennis Racquet String is right for you? 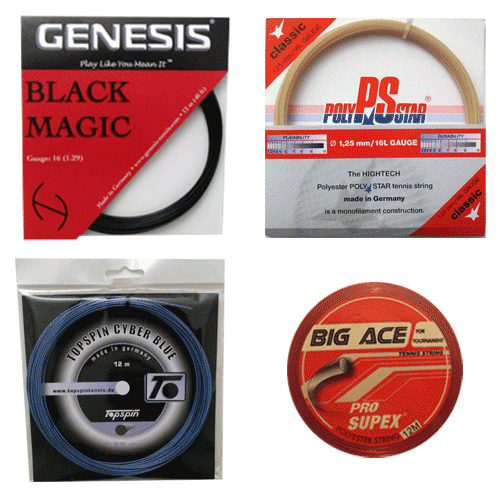 Our sampler packs include our best-sellers including Genesis Black Magic, Topspin Cyber Flash, Topspin Cyber Blue, Topspin Cyber Max ROTation, Polyfibre Black Venom, Signum Pro Poly Plasma among many others. We also have Synthetic gut sampler packs for the player on a budget and seeking some great lower cost and softer alternatives to the co-polyester strings. Those include the Pro Supex Synthetic Gut Spiral Flex which is very similar to the popular Prince Synthetic Gut Duraflex and Prince Lightning, Genesis Blizzard Synthetic gut among others. Have questions? Need professional advise. We are always a phone call or click away! Best Tennis Racquet Strings for SPIN? Everyone wants more spin, right? Well many tennis enthusiasts believe that strings can take ones game to the next level and produce insane amounts of spin. Technique has a major influence in spin generation but strings can help too! In today’s market, there are TONS of spin-friendly strings with the likes of Babolat RPM Blast, Luxilon ALU Power Rough leading the popularity pack as used and endorsed by world#1 Raphael Nadal among others. Here at the Tennis Depot, we have some phenomenal spin-friendly string options all offered at great price-points, softer than the Luxilon ALU Power, Babolat RPM Blast and even Solinco Tour Bite or Solinco Barb Wire co-polyester strings and of similar or better quality, guaranteed! Signum Pro Tornado– Axially twisted and heptagonally shaped.. Great for tension stability! Pro Supex Blue Gear Ultra Spin– Octagonal shaped and twisted. Topspin Culex Squarestring– Square shaped and twisted. 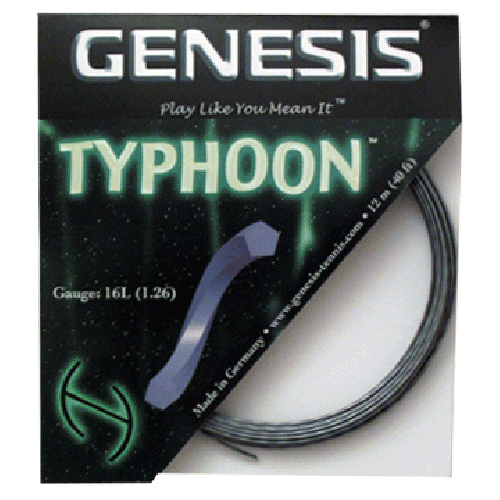 Genesis Typhoon– Pentagonal shaped and twisted. Most similar to Luxilon ALU Power Rough. Topspin, the premier Germany-based company specializing in the production of the highest-quality racquets, strings, apparel and accessories has recently introduced its newest string to the U.S. market, Topspin Culex Squarestring. Topspin is best known for its best-selling Topspin Cyber Flash string, Topspin Cyber Blue and Topspin Max Rotation but this new unique square shaped and twisted co-polyester will take the market by storm. First of all, there aren’t many square shaped strings on the market today other the Solinco Tour Bite but the unique feel, power and comfort that comes along with this new string offer is very intriguing. The product description from Topspin is that the Culex Squarestring is designed to offer optimum control and accessibility to spin. The square profile is designed to help prevent movement and provides extra access to spin. In addition, the string is twisted for maximum ball bite and tension maintenance. One of our playtesters who is Babolat RPM Blast User says that the comfort and feel with this string is unmatched in the marketplace today! 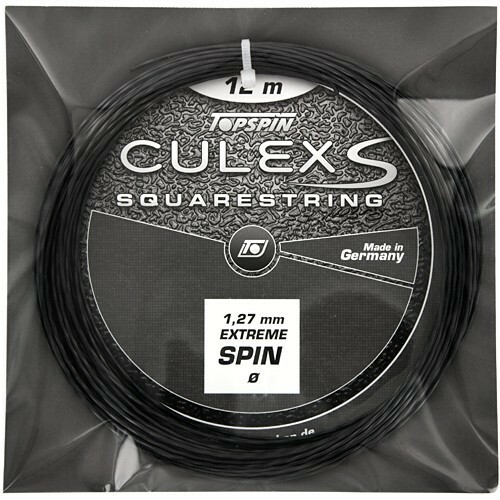 We feel that the spin production of the Topspin Culex Squarestring is exceptional and the tension stability is excellent as well. When price is taken into the equation, this is among the best valued co-polyester strings on the market!